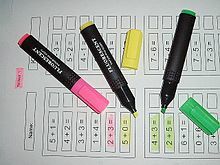 A marker pen used to highlight text. That which highlights or emphasizes something. The IPL was supposed to be a symbol of an ever-more influential, dynamic and prosperous India, a highlighter of its organizational skills and wealth.